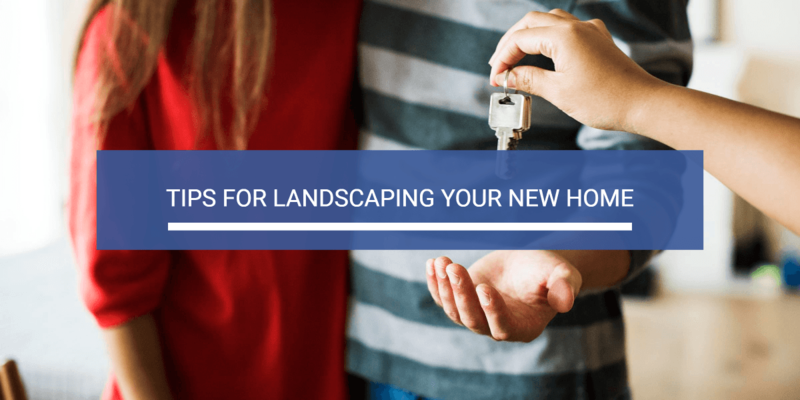 Buying a home is always an exciting time, but many new homeowners don’t consider updating their landscaping after they move in. Whether it’s not enough time or confusion about where to begin, it’s common for new homeowners to put off updating landscaping. To help you plan your next landscaping project, we’ve created this short guide to get your landscaping on track. From planning your landscaping to the final day of the project, there’s a lot that goes into an in-depth landscaping update. Take a look at these top tips for landscaping your new home. Before you break out the shovels and gardening gloves, you need to spend some time thoroughly planning your landscaping project. How do you want your landscaping to look? What’s your budget? Are you outsourcing labor or is this a DIY project? These are just a few of the many questions you should ask yourself during the planning phase of your project. Review the land survey you received during the home buying process to see exactly where your property lines are located. The size of your space often dictates what is possible, and you don’t want to go over your getproperty line and into your neighbor’s yard. Pay close attention to the costs of materials and labor, and consider the pros and cons of a DIY job. Chances are you’ll save some money, but you may not have the tools, skills, or time to do a good job on the landscaping. At the end of the day, the budget will play an important role in your landscaping project, but it shouldn’t be the sole driver of your landscaping. If you want to save as much money as possible, you may be selling yourself short and settling for low-quality work. A landscaping job that’s done correctly may cost a little more, but it’s worth much more in the long run. Set a realistic budget and stick to it. Now that you’ve planned your project and have a budget in place, it’s time for your landscaping to actually be completed. Depending on the size of your project, it may take just a few days or it may take several weeks. Plan your space and schedule accordingly. If heavy machinery is required, try to make access to your space as easy as possible. Will Landscaping Increase Your Home’s Value? After your landscaping is complete, it’s important to maintain your outdoor space. Regular maintenance includes mowing, pruning, watering and fertilizing, and aeration. Neglecting your landscaping is a sure way to ruin your investment, so be sure to make some time to care for your outdoor space. There are many reasons to invest in high-quality landscaping. First and foremost, you’ll dramatically improve the overall look of your home or business. As a result, the value of your home will probably increase after your landscaping project is complete. Quality landscaping creates a pleasant, inviting outdoor space that everyone will enjoy.